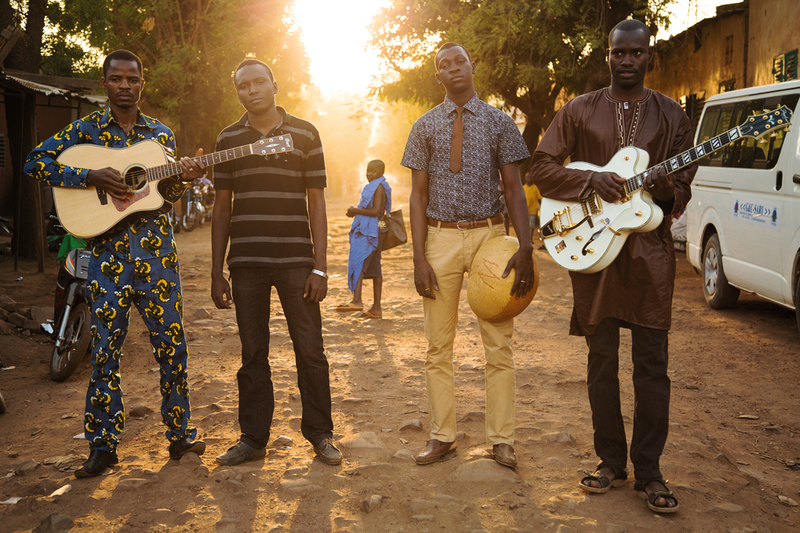 Members of the band Songhoy Blues are among the musicians who appear in the documentary film They Will Have To Kill Us First: Malian Music in Exile. They Will Have To Kill Us First: Malian Music in Exile is a documentary about the difficulties faced by residents of northern Mali, especially the musicians, after a Tuareg rebellion in 2012 was hijacked by Islamist forces. Mosques, tombs, libraries, and ancient manuscripts were destroyed. The imposition of sharia law meant veils for women, amputated limbs for convicted thieves and a ban on all music – even ringtones on cellphones. Musicians fled cities like Gao and Timbuktu in fear for their lives. Among those who appear in the film, some went to Bamako, in Mali’s south, while others went to refugee camps in Burkina Faso. 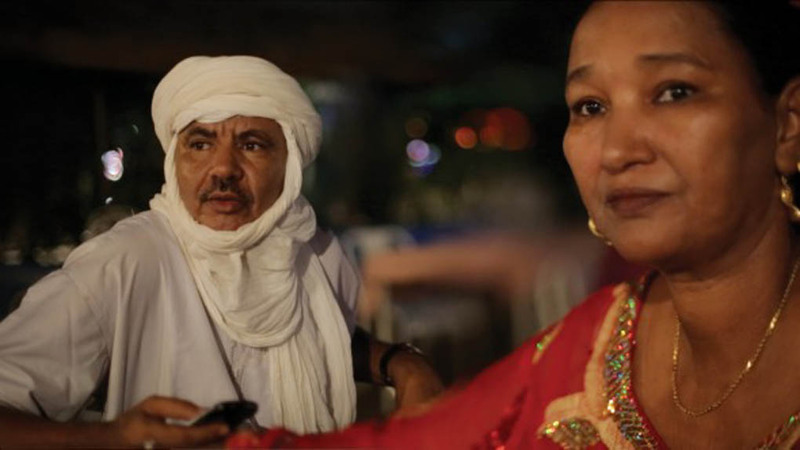 Malian musician Fadimata Walett Oumar, who is nicknamed Disco, right, and her husband Hassan (Jimmy) Mehdi, in a scene from the documentary film They Will Have To Kill Us First: Malian Music in Exile. The film is being shown at RIDM, Montreal’s documentary film festival. The people we meet include established stars Khaira Arby and Fadimata Walett Oumar (nicknamed Disco, because she was a big Madonna fan in her younger days). Disco is a longstanding member of the group Tartit, though it is not named until near the end of the film. She is also married to a high-ranking Malian soldier who changes allegiance more than once, which makes their lives somewhat complicated. The film also serves as a promotional vehicle for a younger band called Songhoy Blues, and includes footage from their U.K. tour. (Earlier this year, they toured North America, making stops at SXSW and in Toronto, too.) You can find music by Khaira Arby, Tartit and Songhoy Blues on iTunes; click on their names to go there. The film’s soundtrack will be released, but sadly, it isn’t ready yet. If you like what you heard in the film, check out Tinariwen, as well. 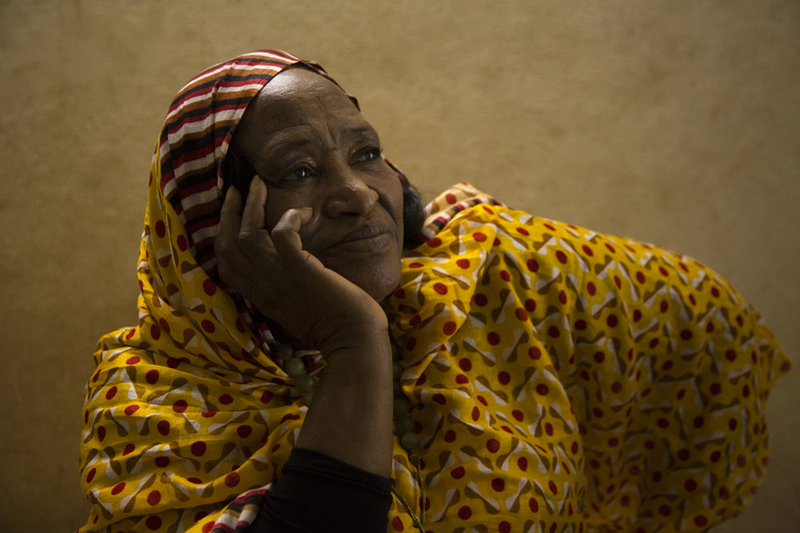 Khaira Arby is among the Malian musicians who appear in the documentary film They Will Have To Kill Us First: Malian Music in Exile. Most of us will never see the wonders of Timbuktu in person, so I appreciated glimpses of them in the film. I suspect that some scenes were shot before the widespread destruction and that many of those intriguing structures no longer exist. Full disclosure, I did watch They Will Have To Kill Us First at home via an online screener, which must have reduced its power considerably. 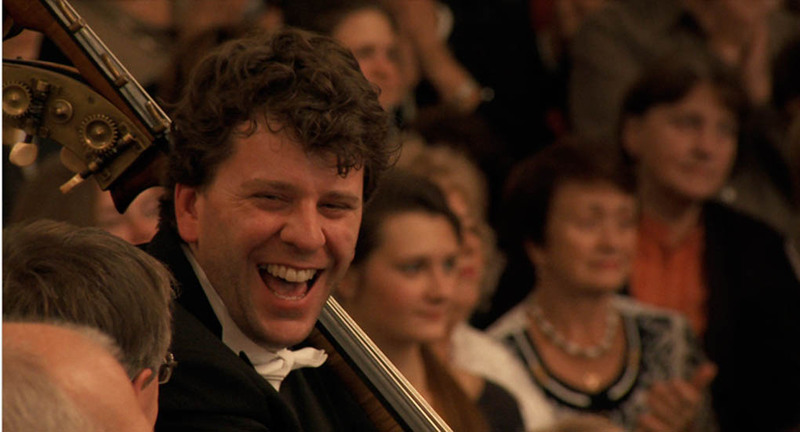 (Justified) spoiler: The film ends with a joyous outdoor concert in Timbuktu, with lots of happy women and children among the audience. Friday, Nov. 13, 2:30 p.m.
Saturday, Nov. 14, 215 p.m.
RIDM (Rencontres internationales du documentaire de Montréal) runs from Nov. 12-22, 2015. 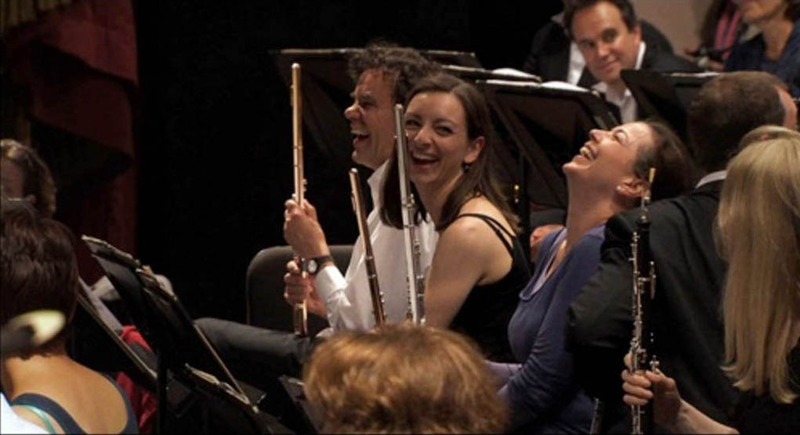 Visit the web site ridm.qc.ca for more information about the festival. I want to go to ShazamFest, don’t you? Musicians and fans at the music-and-more event called ShazamFest. Photo by Claude Dufresne from the ShazamFest web page. 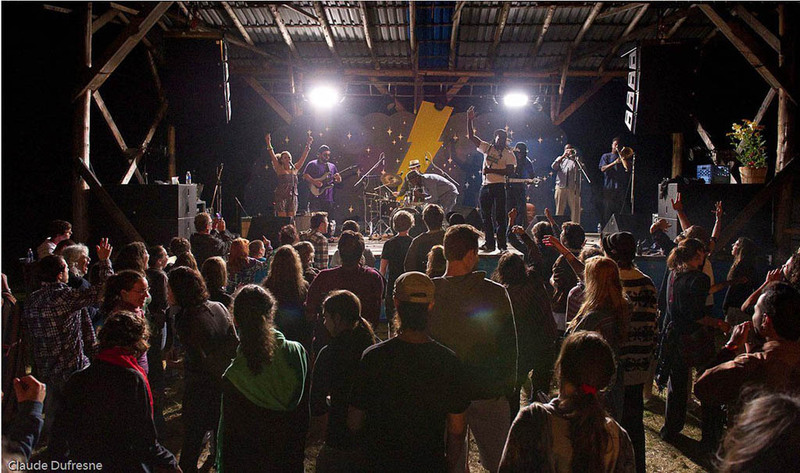 ShazamFest is a family-friendly, music-and-lots-more festival that will present its tenth edition from July 9-12, 2015, on an organic farm in Barnston West, in the Eastern Townships. My first reaction to the locale was “Too far, no car,” but after attending a press conference and meeting some of the incredibly friendly, dedicated, passionate people involved in ShazamFest, including its founder, Ziv Przytyk, I’m hoping I can convince one of my friends with a car to take me there, even if only for one day. Since we’re talking about “one day,” this is a good time to mention that admission to the festival is free on Sunday, July 12. Musical acts at ShazamFest include Buck 65, Socalled, Bob Log III, The Damn Truth and the Lemon Bucket Orkestra. (In an interview with La Tribune last year, ShazamFest founder Ziv Przytyk said that the vocalist for The Damn Truth has a voice like Janis Joplin’s. Sounds good!) 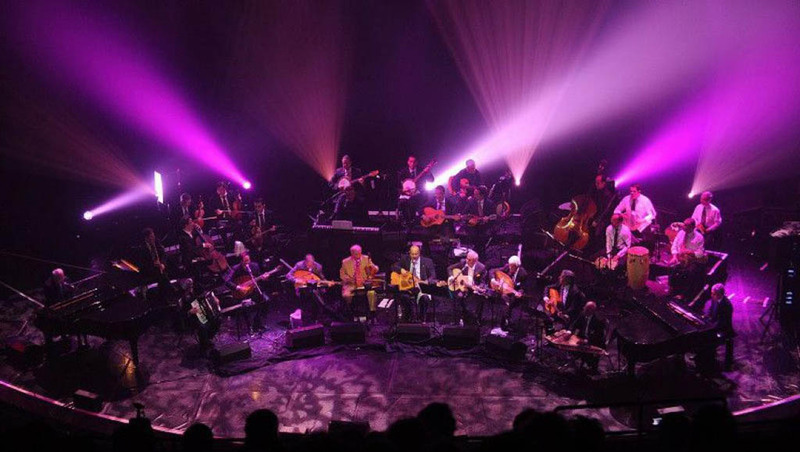 The band Kyriaki will present the Greek music known as Rebetika. See the full lineup and ShazamFest schedule here. Wrestling demonstration at ShazamFest. Needless to say, this is not wrestling as seen at the Olympics, or the Pan-Am Games. Photo from the ShazamFest web page. 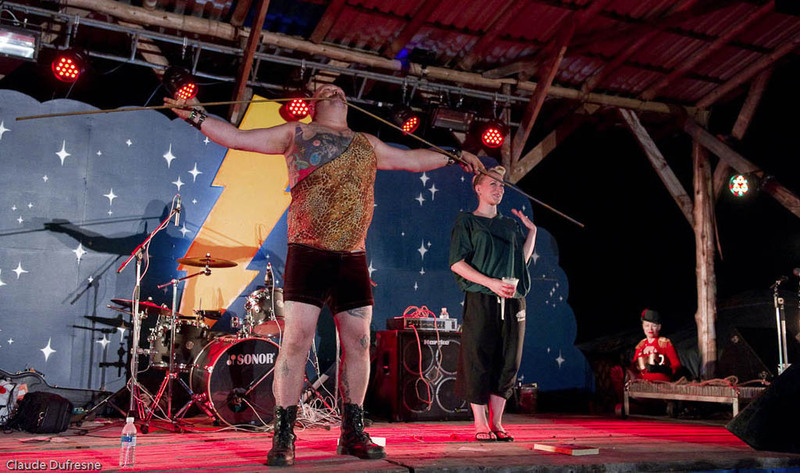 In addition to music, there will be wrestlers and wrestling workshops, circus workshops, a tie-dye workshop, forging with knife maker and blacksmith David MacDonald, yoga on the beach, skateboarding and the Canadian Extreme Laughter Championship. The “ShazamFest Olympics” will include a tug-of-war and stone skipping. People are urged to wear costumes. There will be prizes for the best ones. 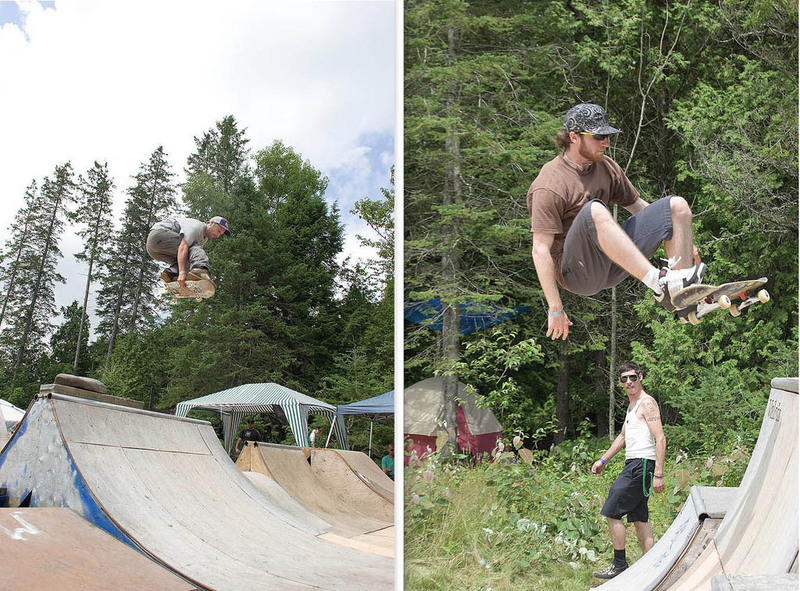 Skateboarders at ShazamFest. Photo from ShazamFest web page. Two kitchens will sell tasty, locally sourced meals, with choices suitable for vegans and carnivores; a third kitchen will sell delicious desserts. The Blue Mushroom Sirkus Psyshow, which has revived the concept of the circus sideshow, will present, among many things, a strongman, sword-swallowing, fire-eating and a burlesque performance by Miss BonBon Bombay that involves flames in, um, surprising and unexpected ways. This was a big hit at the press conference, let me tell you. Miss BonBon Bombay explained that her fire act was a tribute to veteran burlesque performer Satan’s Angel (The Devil’s Own Mistress, Queen of the Fire Tassels), and that it’s done with her permission and blessing. The Blue Mushroom Sirkus Psyshow has an amazing web site at bluemushroompsyshow.org; there are clever biographies of troupe members, that suggest possible supernatural connections, and great photos, too. There’s a Facebook page for the Blue Mushroom Sirkus Psyshow, as well. Strongman The Mighty Leviticus, of The Blue Mushroom Sirkus Psyshow performs at an earlier edition of ShazamFest. I do believe that he is bending steel rebar with his teeth. (Does his dentist know about this? Photo, by Claude Dufresne, from ShazamFest web site. So, what about those people I met? 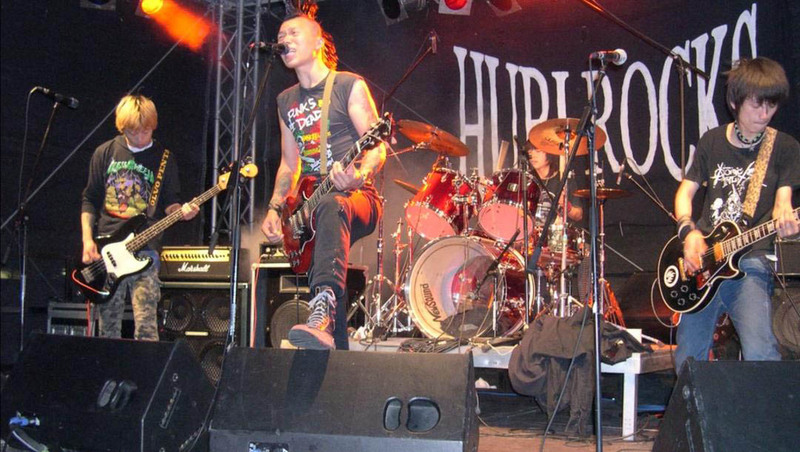 The first one was Ziv Przytyk, the founder of ShazamFest. He was as enthusiastic as all get out, and wearing a bright yellow jumpsuit that he had made himself! Talented guy! He explained that he sees the festival, and its rural location, as a “space to bring people together, to create a community.” The first year 400 people came; these days attendance is around 2,000 people. Those people make networks and build friendships there. The festival is now old enough that sometimes three generations of a family will come. There has never been any kind of trouble at ShazamFest. Ziv has a theory that people behave well at the festival because children are there; they are a civilizing influence. I talked to Miss BonBon Bombay, as mentioned above, and to her colleagues, strongman The Mighty Leviticus, and powerful vocalist Angela Solo. 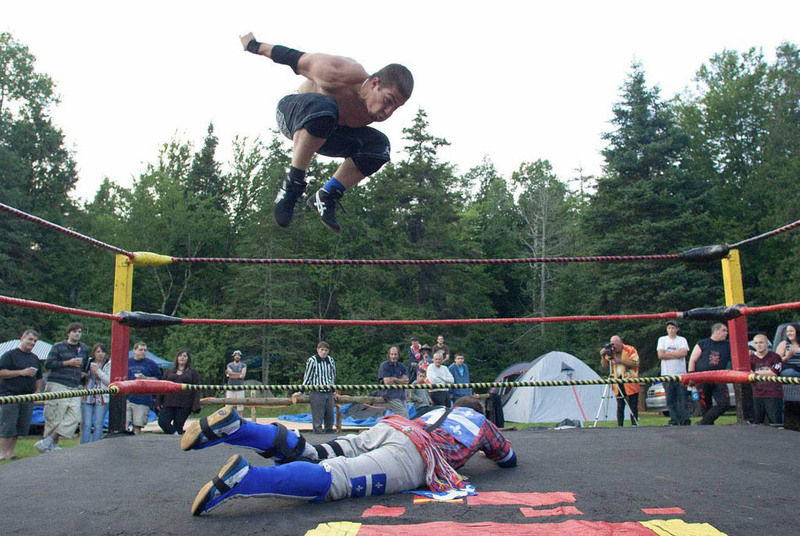 I listened to the singing-and-guitar playing duo Les Deuxluxes, and watched some antics from the Eastern Townships Wrestling Association, who challenged Ziv Przytyk to a showdown at the festival. People who buy a day pass can stay untill the following morning. In keeping with ShazamFest’s environmentally conscious ethos, people who arrive on a bicycle will get a 20-per-cent discount on their tickets. And remember that Sunday is free! Visit ShazamFest’s ticket page for complete details. 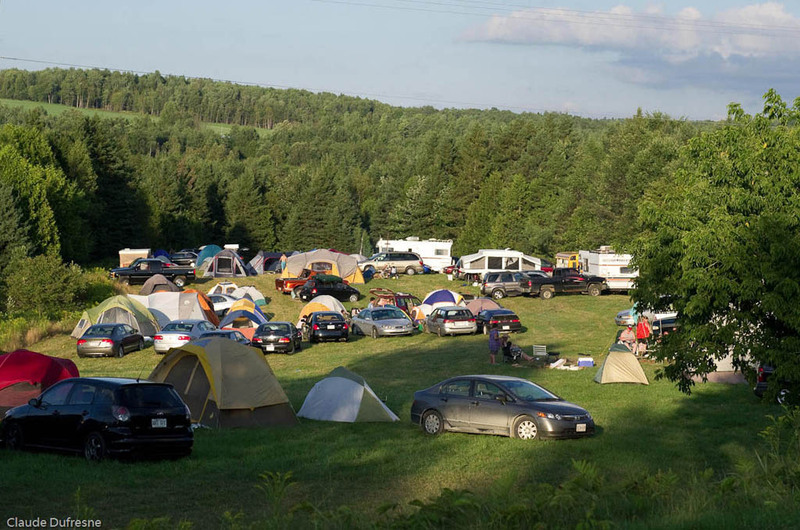 People who attend ShazamFest are welcome to camp overnight. Photo, by Claude Dufresne, from the ShazamFest web site.